This page features older news items from 2003 which have previously been featured on the main news page. Some good news for those of you who have been trying to obtain the elusive CD release of Wise After The Event - EMI are at long last making it available again! Please note that this is in effect a re-pressing of the original 1991 Virgin CD re-issue and there are no extra tracks added to the album other than Squirrel, which was the B-side of the single release of We're All As We Lie. We are pleased to announce that as a result of the sizeable amount of material that has been uncovered, Archive Collection Volume 2 is now planned to be a 2 CD set. In contrast to the first Archive Collection, this will be two full-length CDs with each disc including over 70 minutes worth of previously unreleased material. As with the first volume, there will be a mixture of previously unheard pieces alongside alternate versions and different mixes of known tracks. Track titles and the running order are still being finalised but in the meantime here is how the collection shapes up chronologically in terms of the original recording dates. Please note that this listing is still subject to change. Two additional tracks (from 1973 and 1988 respectively) are also scheduled for inclusion. We currently anticipate a release date for the album sometime in the Spring of 2004. A review of Ant's Radio Clyde CD has been added to the Astro Zombie site, which also features an interesting selection of articles, interviews and reviews of a diverse selection of artists. Click here for their Radio Clyde review. Another review (available to read in either Italian or English) of the Radio Clyde CD can be found on the site for the Italian Genesis magazine Dusk. Thanks to Mario at Dusk for letting us know about this. Steve Hackett's Camino Records have recently revamped their online sales desk and are now offering a good selection of Ant's CDs for sale in addition to Steve's own catalogue and titles by other associated artists. Voiceprint are re-issuing the 1981 Mother Gong release Battle of the Birds, which was previously only available as a cassette release available via mail order and sold at gigs. 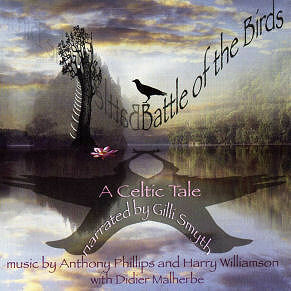 The recording makes use of Ant and Harry Williamson's 1978 recording of Gypsy Suite (with additional flute parts by Didier Malherbe and oboe by Ant's brother Robin) as the backing music for Gilli Smyth's narration of the story of the Battle of the Birds. Harry and friends also contribute some spoken parts as characters in the story and additional musical contributions were also later made by Jan Emerick and Hugh Hopper. Just to be clear, this CD essentially makes use of Ant and Harry's music as the backing for the story and is not a "new" Ant release. Ant's contribution to the recording is confined to his co-writing and playing on Gypsy Suite, which is available in it's original form on the Gypsy Suite CD release. Battle of the Birds is released on Blueprint Records (catalogue number BP359CD) on 12th January 2004. In addition the previously mentioned "two for one" release of A Catch At The Tables and Twelve, Voiceprint are making Back To The Pavilion and Antiques available as a similar set for a limited time. 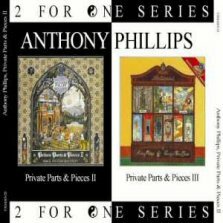 As with the other "two for one" release, this represents an opportunity to pick up these albums at a good price if you do not already have them in your collection. The interview that Ant gave to the "Classic FM" show which is hosted by Gene Godfrey on WBZC in Pemberton NJ is scheduled to be repeated on October 3rd between 6 and 10 pm EST. A webcast is the show is available either via Gene's site which also has more detail about the show or alternatively the WBZC site. Be sure to check your time zones if you are planning to listen to the webcast from outside the US. Thanks to Gene for passing this information on to us. Voiceprint Records have announced a series of "two for one" releases of some selected items from their existing catalogue. As the name suggests, these releases provide the opportunity to buy two CD releases for the cost of one full-price album. 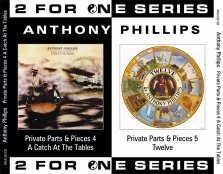 Two of Ant's albums (A Catch At The Tables and Twelve) are being included in this campaign and will be available in this form from 10th November for a limited time. The release will consist of a regular copy of each of the CDs inside a double box. If you do not already have these CDs in your collection then this release offers an opportunity to pick them up at a good price. Ant is currently working on writing and recording music for a new Library project for Atmosphere. As with Ant's other Library projects, this won't be commercially available. Work on other projects, including the new Private Parts & Pieces album and Archive Collection Volume Two is due to resume once Ant has finished this one. A third compilation in the National Trust Music series entitled Escape has just been released and as with the first two volumes in this series (National Trust Music Collection and Tranquil Moods) it includes an orchestral track written by Ant and performed by the BBC Concert Orchestra that is unavailable elsewhere. Ant's track is called Lyme Bay and it was originally written and recorded for an Atmosphere Library release called English Pastoral. Alongside Ant's track the compilation features a wide range of pieces including film music from Titanic, The Piano, The Abyss, tracks by Miles Davis, Phil Coulter and works by composers such as Vaughan Williams, Elgar and Mozart. Escape is a 3 CD set and is available now from Amazon. Thanks to John Myhill for passing on the news about this compilation. Ant has continued to work on material for the next Private Parts & Pieces album and has now written over 40 new pieces as well as a number of links, which in total is enough material for a double album. The material that Ant has written is based around acoustic stringed instruments in both solo and duet form. As well as the usual 6-string and 12-string guitar pieces he has also composed new pieces for charanga, English bouzouki and cittern. Work continues on the album in between other projects. In between work on other projects, Ant in collaboration with Joji Hirota has recently written and recorded the music for Secrets of the Amazon, a pilot show for a potential seven part television series. The programme is presented by filmmaker Nick Gordon and is based around his experiences of much of the unique wildlife to be found in the Amazon region of South America. Ant and Joji have previously written and recorded the music for several of Nick's Survival wildlife programmes including Web of the Spider Monkey, Gremlins: Faces In The Forest and Jaguar: Eater of Souls. Radio Clyde, the Voiceprint release of Ant's 1978 radio session recorded as part of the promotion for Wise After The Event is out now. For the first time the recording is available officially and it has had the pitch of the recording corrected so that Ant no longer plays too fast or sings too high! The cover artwork for the CD is by Peter Cross, his first cover for Ant since New England. Virgin Records have just released The Best Prog Rock Album In The World...Ever!, a 3 CD set which includes tracks from the likes of Genesis, Yes, Emerson Lake & Palmer, Jethro Tull, Camel, Van Der Graaf Generator and many others. Virgin have seen fit to include Which Way The Wind Blows from The Geese & The Ghost on this compilation and whilst they are emphasising the involvement of Mike Rutherford and Phil Collins on the track, it's good to see Ant getting some "mainstream" exposure again. The Best Prog Rock Album In The World...Ever! (VTDCD 533) is available now and can be ordered from Amazon. Anthony Phillips was so shy he quit Genesis on the eve of their success, and embarked on a career of quiet music-making in his home studio, puffing on his pipe and writing charming instrumentals about otters. His devotion to his craft, and his sheer love of playing, contrasts sharply with the lazy, drug-addled arrogance of Britpop and club culture. Thanks to Phil Morris for passing on the details about the compilation. Ant recently gave an interview to the "Classic FM" show which is hosted by Gene Godfrey on WBZC in Pemberton NJ. This will be broadcast on 6th June at around 8 pm EST. Gene reports: "We spoke about his current work on his guitar album; preparing CD re-issues; and he answered a few questions by offering some very nice, heartfelt and (at times) very humorous stories for select tracks". A webcast is the show is available either via Gene's site which also has more detail about the show or alternatively the WBZC site. The release dates for Ant's Radio Clyde CD and Quique Berro Garcia's album Dreams have been revised slightly. Radio Clyde is now set for release on 16th June and Dreams is due for release a week later on 23rd June. The Snapper Music compilation Soundscapes which features a selection of previously released tracks from Ant's back catalogue is now available. Unfortunately there are a couple of errors with the track listing of the compilation as listed on the CD itself. Track 6 on the first CD is actually Dawn Over The Lake and not Heart of Darkness and track 4 on the second CD is actually an edited version of Reaper from the Living Room Concert and not the Opening Theme from Sail The World. There are also a number of errors in the publishing information for the included tracks. These errors are down to Snapper Music - Ant was not involved in the production of this compilation. Update (as of 19/5/03): Snapper Music have been informed of these errors and hope to have them corrected on subsequent pressings. Ant gave an interview via phone on 6th April for the "Mark from Holland" show, which is hosted by Mark C. Deren on Radio Heemskerk. More details about the show can be found here. The official release of Ant's 1978 session for Radio Clyde is now set to appear in May on the Blueprint label. The finishing touches are currently being made to the sleeve design and the mastering of the CD is now completed. The catalogue number for the CD is BP354CD. There is no previously unreleased material on this compilation, which is designed as an introduction to Ant's music. As far as we can tell the Virgin CD release of 1984 is no longer currently available, although some retail outlets may still have copies still for sale. We've updated the relevant pages on the site to reflect this. Voiceprint plan a re-issue of 1984 once the rights to the album revert to Ant's control. Snapper Music are planning to release a 2 CD compilation of Ant's existing album music as a future release in their Recall series. The latest information suggests that the title of the compilation will be Soundscapes and it has been allocated the catalogue number SMDCD458. A planned release date in April has mentioned, although this is not confirmed. The compilation is designed as an introduction to Ant's music for those people who have yet to sample it's delights. Ant has now completed work on his most recent Library music project for Atmosphere. As with all of Ant's Library music projects this won't be commercially available. As is often the case with new releases, the release date for Quique Berro Garcia's album Dreams has slipped back slightly and is now set for May. As soon as we have a firm release date we will of course post it here. A complete track listing for the album can be found here. Ant has also written some sleeve notes for the CD. The Voiceprint CD re-issue of the Intergalactic Touring Band album (which was first released in 1977) is out now. Ant appears on the track Reaching Out, where he plays acoustic guitar. Ant has taken a short break from recording tracks for Private Parts & Pieces XI to work on a new Library Music project for Atmosphere. As with most of Ant's Library Music, this won't be commercially available. The edition of the UK TV show This Is Your Life which featured Mike Rutherford as the subject was broadcast on 23rd January at 7pm. As previously reported, Ant was one of the guests on the show alongside Phil Collins, Tony Banks, Steve Hackett, Bill Bruford, Ray Wilson, Daryl Stuermer and John Silver. Voiceprint Records have announced the planned release date of Quique Berro Garcia's album Sue�os (Dreams) as March 24th. The CD will be released on the Blueprint label (catalogue number BP352CD). As previously mentioned, the album is a collection of acoustic guitar pieces which includes Quique's excellent interpretation of Ant's tracks Nocturne and Field of Eternity amongst others. A complete track listing for the album can be found here. Ant has also written some sleeve notes for the CD. Although we don't know which of the shows in the new series will be Mike's edition (the subject of the programme is never announced in advance), we do know that the new series of This Is Your Life begins at 7pm on Thursday January 2nd on BBC1 in the UK, with the rest of the series to follow in hopefully the same slot.